I knew him, Horatio; a fellow of infinite jest . . . where be your gibes now? Description: An election year cartoon measuring Democratic candidate McClellan’s military failures against the recent successes of his successor, Ulysses S. Grant. At right Grant, portrayed as a bulldog wearing a collar labeled “Lieut. General” and epaulets, sits pugnaciously on the tracks of the “Weldon Railroad,” a Confederate supply route. He looks to Republican presidential incumbent Abraham Lincoln and boasts, “I’m bound to take it.” Grant refers to the city of Richmond, here represented by a doghouse, in which cowers Confederate president Jefferson Davis. Davis, flanked by his own generals Lee (left) and Beauregard, remarks, “You aint got this kennel yet old fellow!” Several other dogs hide behind the house. At far left a dwarf-like McClellan asks the president, “. . . don’t you think you had better call the old dog off now. I’m afraid he’ll hurt those other dogs, if he catches hold of them.” Lincoln answers, “Why little Mac thats the same pack of curs, that chased you aboard of the Gunboat two years ago, they are pretty nearly used up now. 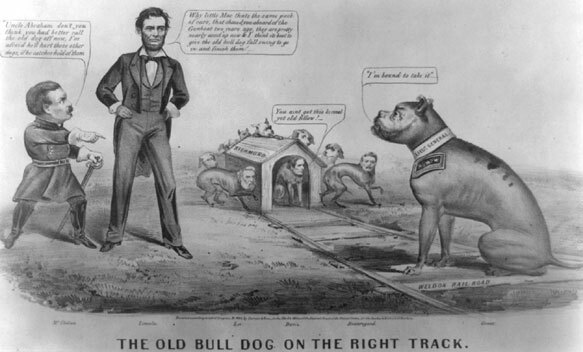 I think its best to give the old bull dog full swing to go in and finish them!” Lincoln refers to McClellan’s failure to counterattack during the Battle of Malvern Hill in 1862. (See “The Gunboat Candidate at the Battle of Malvern Hill,” no. 1864-17.) In contrast, Grant aggressively advanced his army toward Richmond, hoping to force a decisive battle.